Place cherry tomatoes on top of the lid. It should be one level an filled to the corner. Using another lid, top the cherry tomatoes. They should be sandwiched between two lids. 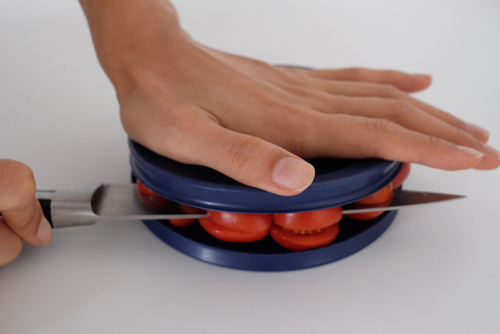 With your palm, lightly press the lid and give enough pressure so that the cherry tomatoes with be tightly squeezed but not squashed. With a sharp and long knife, slice the cherry tomatoes between two lids.